You just bought a new kitty to your house and you are looking for a way to make her look cuter than she already is. 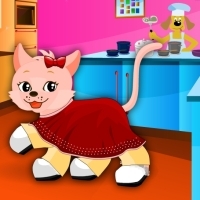 In this kitten dress-up game you can customize the look and appearance of your cute and furry kitten as much as you want. Try all available combinations and for as long as you want. You'll also be able to print an image of your dressed-up kitten once you'll have found a perfect combination. 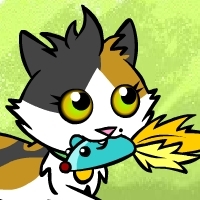 Amusing point and click flash game in which you'll have to help the kitten Zophie retrieve her favorite cuddly toy: a ducky little mouse. The cuddly toy is on top of the television and Zophie will have to find a way to get him back... can you help kitten Zophie in getting back her favorite toy? Hey, wait... there are three cute cats that need your attention. Their names are Toyger, Sphinx and Scottish Fold. Choose one of them and start taking care of him! You will first need to wash the cat but remember to adjust the water temperature to warm before doing this. Use the correct shampoo and wash your cute cat. You will also find a pet comb and an hairdryer to comb and dry your beautiful cat. Cut the cat's nail using the nail clipper and don't forget to clean the cat's teeth and ears. You've got a cute kitty named MiMi that loves fashion more than you do! To make MiMi a happier kitten, you'll have to bring her to the best fashion shop in town! There is a famous kitten salon just around the corner of your house and there you'll be able to take care of your kitty MiMi in the way she deserves. 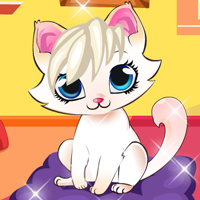 Have fun in the salon and do your best to make MiMi feel like the most fashionable kitten in town! While on vacation with the DoliDoli family, the kitten Sisi met an handsome kitten and she's now flirting with him. Your task is to help Sisi to hide her kissing sessions with the handsome kitten. Have fun while helping the two kittens in love to hide their passionate kisses from everybody's eyes! 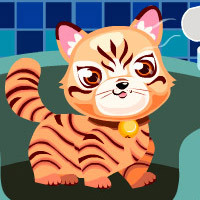 In this funny pet caring game you have to make sure all pets are well taken care of. You will need to feed, clean and play with many puppies and kittens. Check the pets all the time and make sure that each one of them is happy and feeling well. Read the onscreen instructions to find out how to properly take care of the animals. We are sure that girls will go crazy for this pet caring game and we do understand: taking care of our pets always brings lots of fun and joy! Because kittens caught on camera are... cute! Kittens are cute on pics but they are also cute when caught on camera. That is why we've decided to bring together the top ten cutest kitten videos found on YouTube. We have been watching tons of video of young little cats doing the funniest things on tape and after a long discussion we finally came up with our personal kittens' video charts. 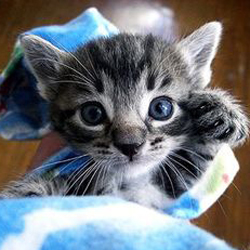 You can find it here right above: the top ten cutest kitten videos that you can find on YouTube. We hope you'll enjoy watching them as much as we did!